Editor Kurt Lawton talks about why data is so important in making the decisions that lead to a profit on your farm. As we close yet another 365-day orbit around the sun, it’s a good time to reflect on 2016, find the positives, and ponder changes for 2017. As CSD Data Decisions columnist Dan Frieberg writes this month , he suggests making New Year’s business resolutions. Like he mentions, If you haven’t been using data to make many decisions, check out the great case he makes by simply examining a yield map to help you find more revenue and hopefully more profit in any field. I bring up this subject of getting unstuck with data-driven decisions because we write about farmers who have found or are working toward greater efficiency and revenue thanks to sound data science. Unfortunately, there are many more farmers who are stuck, trying to become more efficient without using sound data, or using limited data. According to a 2016 data use survey we conducted, leading into our Ag Data Conference we held in late November, it confirmed some of the sticking points. 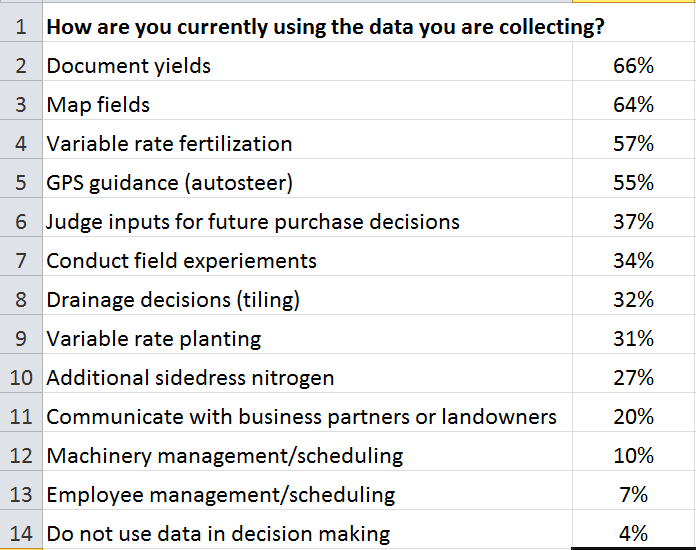 As you can see in this table, we asked “How are you currently using the data you are collecting?” I was surprised that only 66% of survey respondents document yields. And, only 34% conduct field experiments using data; only 27% use data to sidedress nitrogen. On the plus side, variable rate use is growing as 57% use data for VR fertilizer applications and 31% vary their planting rates. While the results from 1,296 farmers show that data use is increasing, many farmers have great opportunity to expand their farm efficiency. We wish you success in your 2016 analysis, which hopefully leads to greater data use that can drive more bushels per acre at a reduced cost per bushel. It’s not easy, but there are many good advisors and services available to help. I sincerely thank you for reading, for viewing more valuable content on csdigest.com, for subscribing to our newsletters, and for being willing to Think Different.